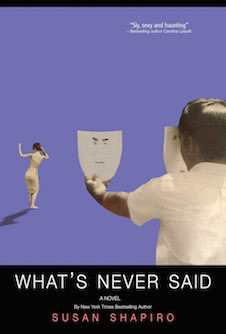 Just as the topic of professor/student relationships is heating up (Harvard and other universities are now banning such liaisons), novelist, essayist and humor writer Susan Shapiro offers her own take on the highly charged subject in her captivating new novel, What’s Never Said. Lila Penn, a naïve, fatherless young woman from Wisconsin, comes to the big city to study poetry and falls, head-first, for Daniel Wildman, her distinguished professor, who also happens to be twenty years her senior. Decades after their tangled involvement ends, she arranges a meeting in downtown Manhattan. But the shocking encounter blindsides Lila, causing her to question her memory—and her sanity. Moving back and forth between Greenwich Village, Vermont, and Tel Aviv, Shapiro slowly unravels the painful history that has haunted both Daniel and Lila for thirty years. In the excerpt below, Lila’s mother encounters her daughter’s new love interest for the first time. At the book table, Lila’s mother took ten dollars to buy Cormick’s Celtic Songs of the Heartland. Before Lila could stop her, she bumped into Daniel. Daniel thrust out his arm. “The infamous Hannah Lerner,” he said, his eyes catching Cormick’s book slipping into her purse. “The infamous Daniel Wildman.” They shook robustly. A group of aspiring authors interrupted. “Your public awaits you,” Lila said, hoping nobody could tell she was into him. “I hope you’re having a nice birthday,” he threw in before walking off. Lila waved, putting on her coat, watching Daniel leave without her. “That coat looks lovely,” her mother said, straightening the collar of the black jacket she’d bought Lila on sale at Loehmann’s. In the store it looked regal; now Lila wished it were lighter, cashmere. They walked out the side door. Flushed from seeing Daniel, Lila steered her mom toward a bench. They sat down. “Are you sleeping with him?” Hannah asked. “Why do you think we are?” Lila was stunned by her bluntness. “You think so?” Lila was jolted by how casual her mom sounded. And wildly intrigued. But Daniel hadn’t even tried to kiss her. “You’re only attracted to him intellectually?” her mom probed. Was her mom talking about herself? Or Lila not recovering from her father’s death? “You were madly in love with Dad,” Lila said. “You want to marry him or be him?” Hannah asked her daughter. “He hasn’t found the right one yet because it’s me,” Lila said.